Life is a highway and a rollercoaster ride. It has it’s ups and downs, its dips and its potholes. So what happens when we hit one of them? When we take a detour, or worse, make a u-turn on the road of life? Do we throw in the towel? Grab a box of chocolates, donuts, or a bottle of booze? Is it even possible to keep our peace and joy when “unfair” and unexpected hardships come our way? The answer is yes, and since I’m getting yet another opportunity to practice my pothole navigation techniques, thought I’d jot them down and share them with those who may have hit a pothole or two themselves recently. First and foremost, I remind myself of one major truth. God is in control and I am not. Kind of puts things in a better perspective, doesn’t it? Now, I may not like, agree with or even understand why a certain situation or series of events happens, but this I do know. God allows – say allows – circumstances to shape us and mold us. Like the clay in the potter’s hand, we can only be shaped and molded if we are pliable! In other words: soft, non-resistant, surrendered. I don’t stamp my feet, wring my hands or shake my fist at the universe in protest. Nor do I go out and blow my diet, my budget, or my temper. I believe it was Oprah Winfrey who coined the phrase, “All stress comes from resisting what is.” I love that! When I surrender to the realities of life, I don’t waste my energy, lose my peace or my joy. I just accept the fact that God allowed something to happen for a reason. Then it’s time for praise. What you say? Praise? Yes, praise. As in praising God. For those who may not be familiar, praise comes in several forms such as singing, worshipping, lifting up the names of God, praying out loud. Don’t ask me how it works, all I know is that it does work. When I lift up the name of Jesus, something in the atmosphere changes. My focus changes. The heaviness I may be feeling, dissipates. Since I didn’t expend all my energy or time bemoaning or complaining, I have energy to praise and praise is POWERFUL!!! Tip to the wise : if something is difficult to do, it is probably because it has the most benefit to you. Think about that one for a bit. Somehow when I start praising God, the cobwebs clear. My joy level starts to percolate like the morning coffee. While I’m thinking about it, praise makes a great way to start your day, so next time you put on that a.m. pot of coffee, sing a song to God and then see how much better your day goes. But, I digress. Sometimes, God will intervene and remove the situation.Don’t we love it when that happens? But more often, we just have to ride it out with a smile on our face, I might add. There is a lesson to be learned and it will become clear sooner or later. We only lengthen the duration of the test if we have a dour sour attitude. So, to recap. When we are going through a difficult time and things are not going the way we would like, we can choose to respond in ways that will preserve our joy. 3) Praise God for his great love, plan, and purpose in our life. 4) Ask God to reveal the lesson that He wants us to learn. Hope these pointers help you circumnavigate the next pothole you come across. Until next time, check out this video by one of my favorite bands, Rascal Flatts, and do forward this to a friend who may need to hear it as well! Are you looking for more joy in your life? Are you tired of the same old same old? Has the flame of passion flickered out? Well then! Today is your lucky day! Because there are some things you can do to bring more joy into your daily existence. After all, if we don’t enjoy each day, isn’t something sadly missing? Now, I’m not talking about winning the lottery or escaping to some sunny vacation spot every chance you get. Those things bring happiness true, but not necessarily joy. Ask some of the rich and famous. Happiness depends on circumstances. Happiness is a fleeting feeling. Joy is totally different. Joy, the older sister of happiness, comes from deep inside. Joy is an eternal fountain that waters our souls. It does not depend on our circumstances. In fact, joy can still be had even in the worst of situations. Really! So I sent my mom a letter on how to have more joy. She recently lost her husband and at 85 years of age, is now dealing with all the stuff of taking care of a huge house, paying the bills, and basically living a single life after 30 years of being married. “I got your letter”, she says over the phone. Notice the key word “feeling”. Well, there you go. Joy is not a feeling. Joy is a gift from God. 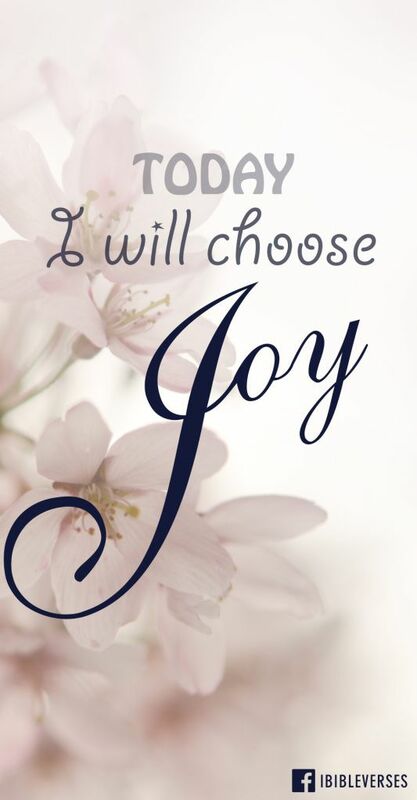 Joy is a choice and a practice. The fountain of joy stems from the knowledge that God is in control and He allows situations into our lives that might not make us “feel” joyful, but they are, ultimately, for our good. Joy is a fruit of the Spirit, which means in each of us has been deposited the seed of joy. It is up to us to nurture and grow that seed until it becomes the fountain that we so desire. And that takes a bit of work and some practice. We have a part to play in this whole thing too. But that’s for another post. When you combine happiness (outside circumstances) with joy (inner delight) watch your world explode! You will be jumping up and down like I do and people will think you are crazy! Let them! Have you ever given thought to the difference between happiness and joy? To learn more about joy stay tuned for upcoming posts. In the meantime, please post a comment as I’d love to hear your thoughts. Until next time, keep looking up!